Understand Your Taste -- You should have a handle on your own wine tastes before venturing forth. Do you enjoy a nice Columbia Crest Chardonnay or Rutherford Hill Merlot? Or perhaps you really enjoy Italian wines from Tuscany or Pinot Noirs. This gives you a great starting point when surveying a wine list. You can search for grapes you enjoy (such as Pinot Noir, Chardonnay or Merlot), brands you trust (such as Rutherford Hill or Columbia Crest) or a country. By knowing your wine style, it also provides important information to your waiter or sommelier so they can provide proper guidance. This helps you avoid buying what might be a great wine for someone else, but a complete mismatch for you. Do Some Advance Scouting -- I sometimes have to make group dinner reservations for out of town meetings. The internet is a lifesaver. I can go on-line, view photos of the restaurants, see a map, check out the menu and -- certainly crucial to the dining decision -- view the wine list. If the restaurant you're going to has an online wine list, check it out. At your leisure you'll be able to get an idea of the prices and your options. You can go in prepared with several choices. This will avoid having your eyes glaze over when you are handed a four-inch thick wine list. You can even research some of the wines on the internet by doing a Google search. Some restaurants even have suggested wine pairings. Find Your Style Wine -- When viewing the wine list, you should first determine how it is organized. Traditional wine lists are organized by categories, such as wines by the glass, white wines, sparkling wines and red wines. More progressive wine lists organize wines by the grape variety used to make the wine, Chardonnay, Pinot Noir, or Merlot, for example. More recently some restaurants and wine bars organize their wines by the taste of the wine: "crisp, dry whites," "fruit forward reds" or "full bodied." Zip to the category that sounds like it best suits your taste. If you are not sure what that is, look for your favorite wines or wineries on the list and use that category as a starting point. 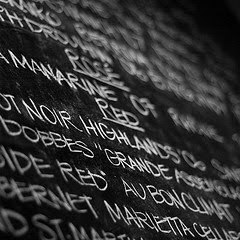 Find the Sweet Spot in the Wine List -- A quick glance at the wine list will reveal that you'll have a few inexpensive selections, a number of costly options, but that most wines will be clustered in one price range. This is the "sweet spot" where you'll be able to locate a great wine at a reasonable cost. The wine cost is usually benchmarked against the highest priced entree. At national chain restaurants, the cost is usually $5 to $10 more than the highest entree. At fine dining or destination restaurants, it is usually $10 to $20 more. So, if you are at casual dining restaurant, and the highest priced entree is $22, you can expect a nice selection of wines in the $27 to $32 range. Can You Get A Bargain? -- Every restaurant has a supply of usually mediocre red and white wines to offer as their house wines. If someone doesn't specify their wine beyond "red" or "white," this is what they'll get. My advice is to steer clear of this. There are bargains to be had, though. Some restaurants will have featured wines. Recently at an upscale Italian restaurant in Denver, they featured cuisine from a different Italian region each month along with a wine selection from that region. This was a nice way to sample a unique wine at a reasonable price. Other restaurants offer featured wines selected by the chef. Since they have ordered a large quantity of the wine they will offer it at a lower bottle or by the glass price. There is so much good wine out there these days, you can certainly find an enjoyable glass for a reasonable price. You can also find bargains by being a bit unconventional. Instead of the standard Chardonnay or Cabernet Sauvignon, you can try different varietals or countries. For example, for a white, try a Riesling, Fume Blanc or Sauvignon Blanc. For a red try a California Zinfandel or anything from Chile. Advice From Your Server -- Should you ask for guidance from your server? I must admit that for many years I lived up to the stereotype of men who refused to ask for directions (thank goodness for GPS) and would not ask for suggestions from servers. I've changed my tune. First try to determine whether the restaurant and the server are tuned in to wine. If my server doesn't know the difference between Pinot Noir and Cabernet, for example, I figure there isn't much to be gained from him or her. Others, however are eager to share their knowledge and since they know the dishes can provide good guidance on pairings. If the restaurant has a sommelier, it is always nice to get their suggestions. If you follow their advice and enjoy the bottle, be sure to give them a tip. The Very Best Tip for Ordering Wine -- This is a little trick I started using a few years ago. If you want a suggestion in a particular price range, you can say, "We are considering this wine. What do you think?" When you show the list to the waiter, point to the price. This allows you to indicate your price ceiling without losing dignity. Usually the server will pick up on your cue. Glass or Bottle -- If you and a guest are each planning on having two glasses of wine with your meal, your best bet price-wise is a bottle. Those high per glass prices add up quickly. However, if you want variety -- especially at a wine bar or a restaurant with an extensive per glass list -- going by the glass is the ticket. Some wine-centered restaurants offer flights of wine (Poco Piatti at Levis Commons, for example) and this is a fun way to test a variety of wines. Another option is a half bottle, although the choice is usually limited.